There are all types of witches out there. Of course, there are wicked witches who enjoy brewing and bottling up potions, there are also downright evil witches who put curses and hexes on their enemies, and finally, there are good witches out there, too. 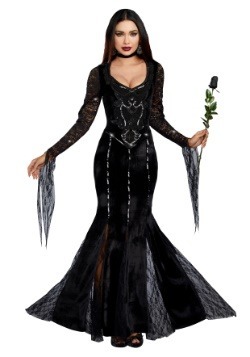 Good witches are often beautiful and they cast spells that will help others. What kind of witch will you decide to be? 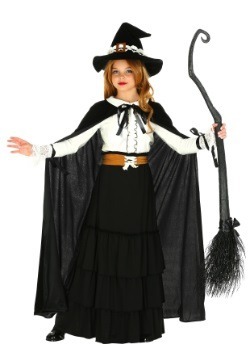 No matter what you choose, we have witch costume styles that will suit all kinds of fashionistas and trend-setter. 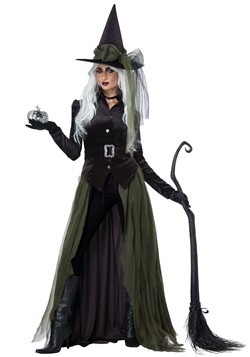 Whether you are looking to be the ultimate glam witch or you are browsing for a more traditional witch costume, you'll find everything you need right here to dress up as a convincing, cackling, and conniving sorceress. 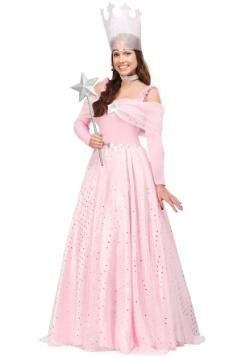 We picked out some of our favorite costumes and we know you are bound to fall in love with one of these wicked looks. 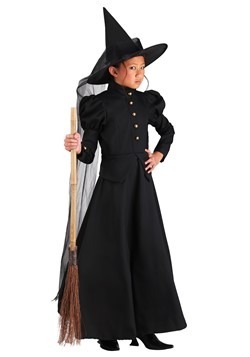 From full-coverage to scandalous, from women's costume to kid's costumes, we've compiled some of the most stylish witch costumes for your convenience. 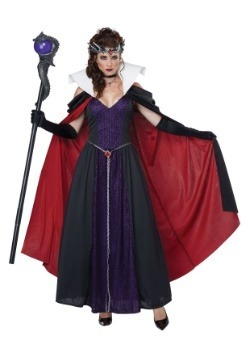 Take a look and go with the costume that puts you under a spell! Holy hocus pocus! 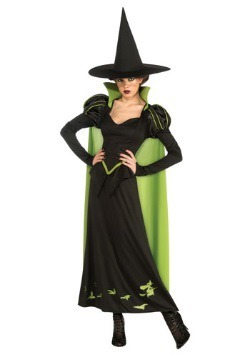 Put away your eye of newt and your toe of frog because you won't need to conjure a potion in order to make this witch costume look chic. 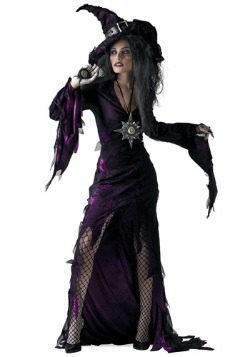 This costume will turn you into a retro-style witch who looks stylish, mysterious, and enchanting. 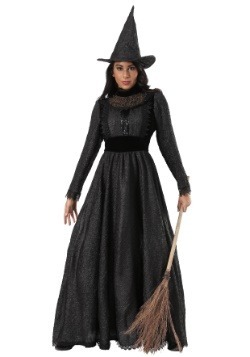 We're so obsessed with this particular bewitching witch costume, not only because of its vintage flair, but also because of the adorable cut of the dress. 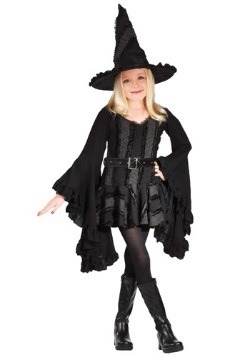 This all black costume has a high-neck line, large collar, and short hemline so you'll look cute, bold, and seductive. The capped sleeves add a dainty touch, while the included belt cinches the whole look together. You'll look like a preppy witch who is getting together with her coven for some sassy spell-casting later in the evening. 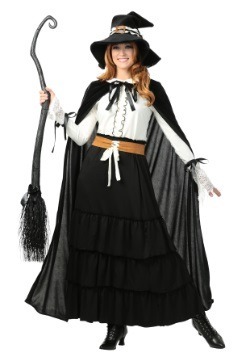 Just add some basic accessories to your look and you'll be ready to take flight on your broom. 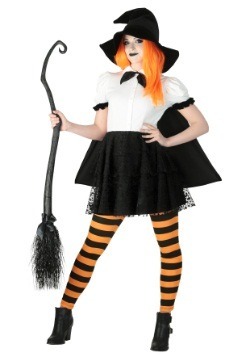 We recommend adding some long black gloves, heels, a petticoat, witch hat, and a broom to your final look! The bewitching hour is upon us! 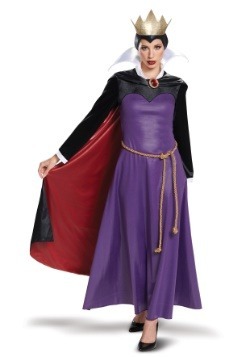 If you want to look like a ravishing sorceress, this raven witch costume will be right up your alley. 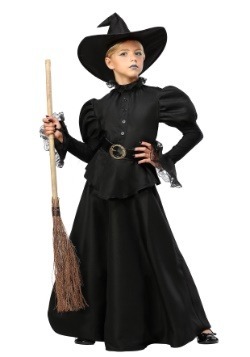 This is by far the trendiest and most modern witch costume that we have to offer. 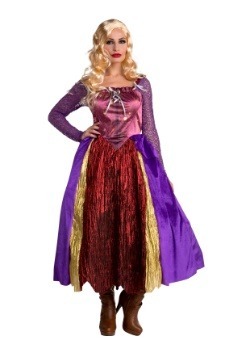 This ensemble is great for women who want a scandalous and tight-fitting outfit that will transform them into an enchantress that looks like she's ready to walk down a runway instead of taking flight on a broom. 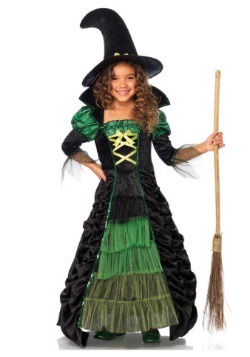 People will forget all about the typical witch stereotype (you know the one we're referring to: green skin, a hook nose, and covered in icky warts), when they catch sight of you in this seductive little number. 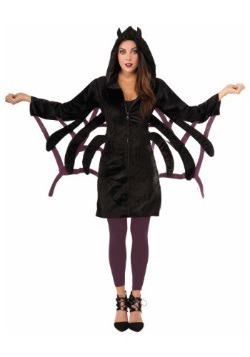 This costume consists of a black catsuit, featuring lots of straps, iridescent fabric, and draping tulle that hangs from the hip all the way to the ground. This creates a chic maxi skirt illusion, so if you wear this costume, it will look like you are wearing both a stylish jumpsuit and a long maxi dress. 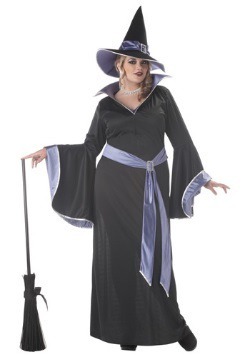 This exclusive witch costume comes with the matching hat and a pair of long gloves and you can only get it right here on Halloweencostumes.com. 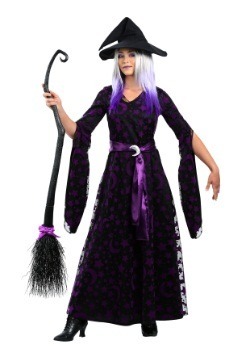 Pick up a cool witch hat, broom accessory and a black cat prop and you'll easily be the most popular witch in your coven! 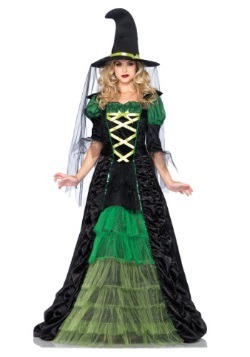 You'll be adding a historical element to your costume if you decide to dress as a witch from the Salem Witch Trials. 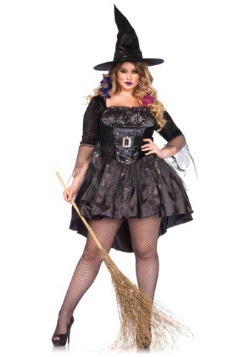 This is by far the scariest look that we could find because supposed witches were really executed in the 1600's if they were accused of practicing witchcraft. Yikes! 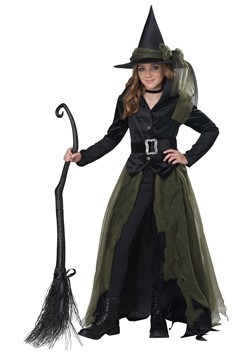 If you are interested in dressing as this demonic witch you better start rehearsing your best evil cackle and you also better study your hexes and incantations because you have a lot of revenge to dole out. 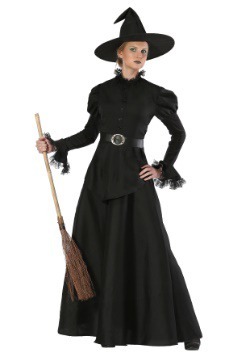 This Salem witch costume is perfect for ladies who want to be the scariest type of witch. 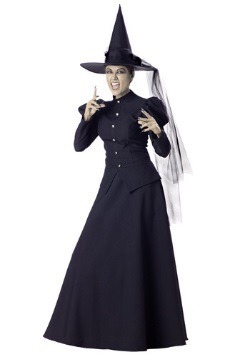 The full-coverage costume is reminiscent of a pilgrim costume, however the bottom of the dress and the sleeves are tattered. There are blood stains on the collar and the year 1962 is written in blood on the apron. The included noose necklace completes this gory look and allows everyone to know exactly how you died. 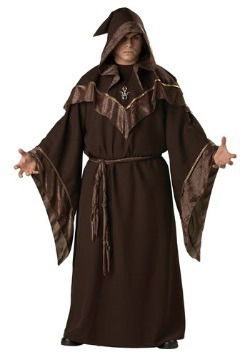 Don this outfit and start whipping up a vial of your most potent potion because now you have to seek revenge on all your accusers! 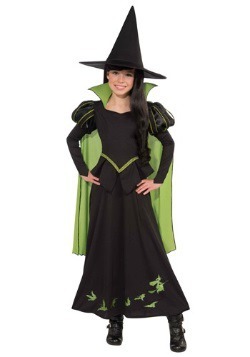 Even little girls can get in on all the wicked fun! 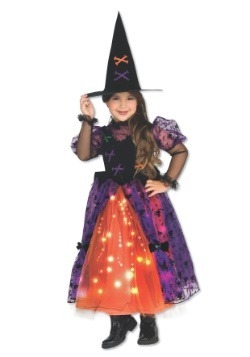 Girls will love dressing in a witch costume because it's a little bit spooky and a little bit glamorous too. 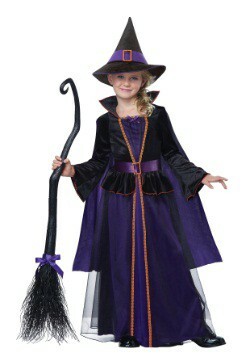 Take this girls witch costume, for instance! 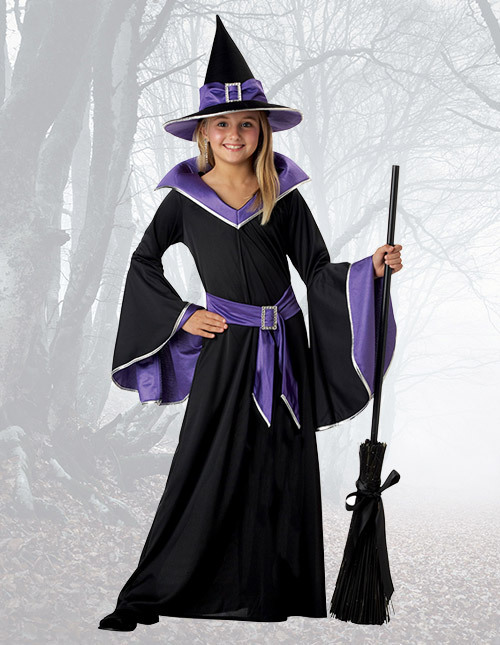 Our glamour witch costume consists of a long dress with huge bell sleeves (these sleeves will make stirring a potion in a cauldron a lot of fun!). The purple accents on the dress, like the belt with rhinestone buckle and the large pointy collar, adds a pop of color to this look. The included hat also features rhinestones because the more bling, the better! 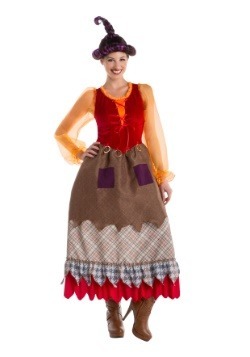 Girls will love this costume because it's very traditional, yet the purple touches make it modern and sassy. 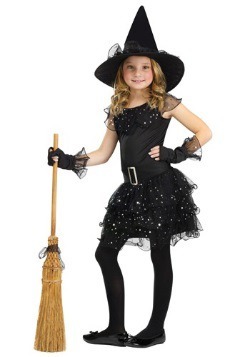 Add some black tights to the look for some extra warmth and use a broom as a cool prop. She'll love pretending to take flight as a glamour witch! Before you take flight on your broom to join your coven for the witching hour, we highly recommend that you add some wicked accessories to your haunting ensemble. These tiny trinkets and charming props will make a huge difference to your final look. We have compiled some of our favorite witch accessories so you can fill your shopping cart with everything you need in order to look like a seriously spooky sorceress. Whether you're going to be a good witch or a bad witch, you'll need these must-have essentials before you stir the cauldron and bottle your potion! Witches need some reliable footwear because they're often on their feet while they're doling out their hexes and curses. Whether they're jumping on their broom and flying off into the night or skipping around their colossal sized cauldron, witches need comfortable shoes. 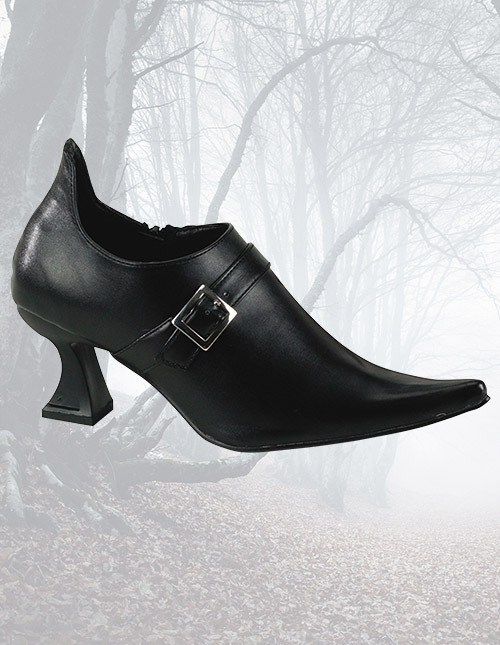 These adult witch shoes are perfect to wear while doing your witchy activities because they have a pointed toe, silver buckle, and small chunky heel so you won't ever have throbbing feet. 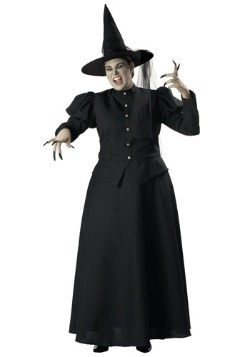 Plus, these classic witch shoes look great with any witch themed costume that you pick out! 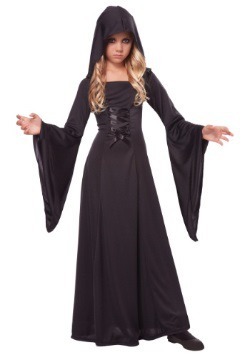 Capes have the power to enshroud your body in mystery...which is why witches love to wear them. 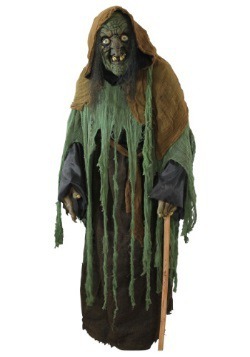 Plus, they look really cool when you need to dash off into the darkness to avoid being outed for being a witch. 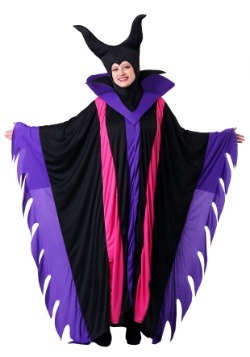 This deluxe velvet cape features purple satin lining and an oversized hood, so it gives off a luxurious, yet creepy vibe, which is perfect for all of the witches out there. 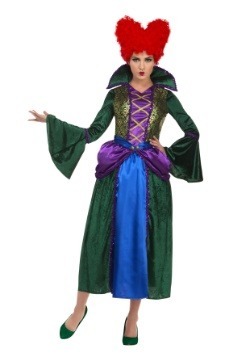 Pair this with any adult witch costume that enchants you and then get ready to mystify everyone that you meet. Practice your best spin and then you can vanish into the night! 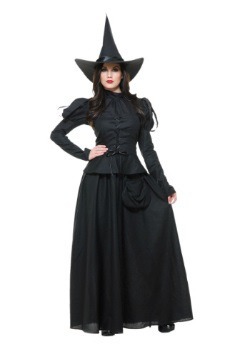 Ready to take your witch Halloween costume to the next level? 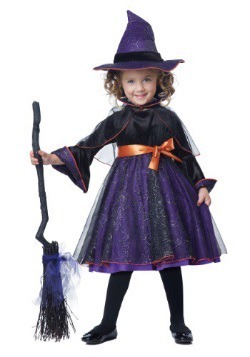 Brooms are a necessity for all the witches who are lurking out there! How are you going to put hexes on your enemies at a rapid speed if you can't fly around? 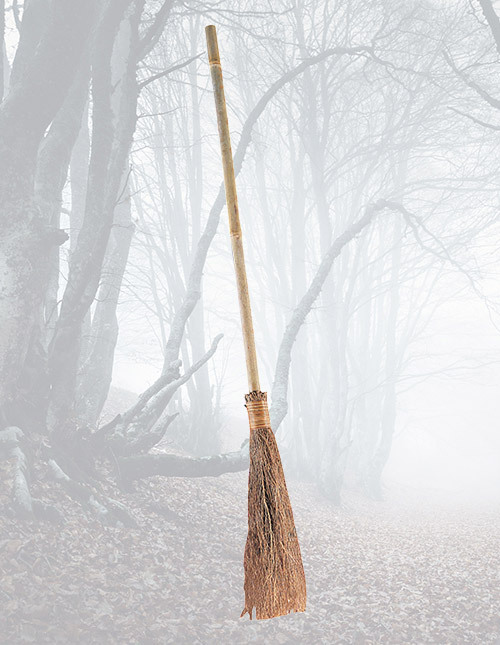 Only really powerful witches can fly without the help of a broom, so if you're still working on your flying finesse, then take a look at this broom. 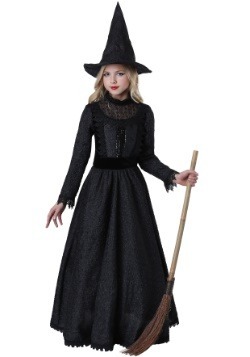 This straw broom is great for beginners, plus it also works well with any witch costume that catches your eye. Don't use this broom to sweep up the floor though because this bewitching broom is specifically made for those who practice magic! Long hair takes years to grow, so it's no wonder why witches have such long and luscious locks. Witches can live for hundreds of years so that's a lot of time to grow out their hair, plus they can always use charms to make their hair grow too! Us mere mortals have to grow our hair the old fashioned way...or do we? 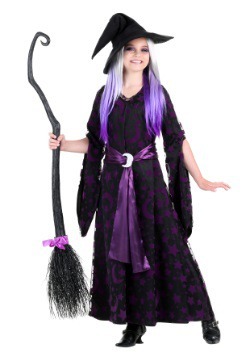 This black wig from the popular wig brand, Fever, will give you hair that cascades long past your shoulders with high quality, so you can make any witch costume look more convincing. 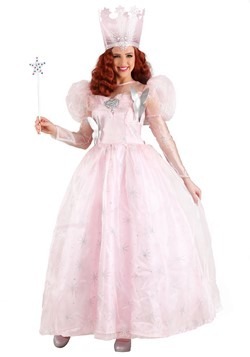 This wig will give you the length that you desire, while also making you appear just a tad bit mischievous. Top off your new hairdo with a pointy hat and you'll have the witchy look that you want!